“You and I both know what this is: an attempt to minimize the department’s profile to the president. Fewer speakers means fewer headlines means fewer angry tweets from the Lincoln bedroom," said one former senior military official who asked to speak on background. Pentagon officials provided internal memos to Defense One on Tuesday confirming the existence of the restrictions. (USNI News put the memos online in February, but they went generally unnoticed and DOD did not make the public aware.) 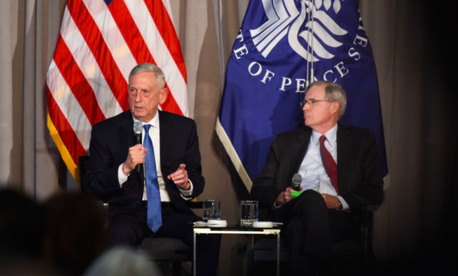 Defense One had asked the Office of the Secretary of Defense to explain why two of four senior DOD officials due to speak at Thursday’s Defense One Summit had suddenly cancelled. Charlie Summers, the defense secretary’s principal deputy assistant for public affairs, said the speakers were pulled to comply with the directive. In previous versions of the annual conference, the Pentagon had sent multiple senior leaders to be interviewed onstage. One week later, the department’s Chief Management Office issued a second memo with guidelines implementing the restrictions. Each military department and agency must choose which leader to put forward on a given day, notify the CMO 30 days in advance, and wait to hear whose proposed appearance has been approved. “Minimizing the number of civilian executives attending these events is critical to conserving senior leader time,” it says. The Joint Staff that week issued its own memorandum conveying the restriction would apply to the O-10 ranks, or four-star generals and admirals, with the same language stressing "minimizing" their participation in events. When Dunford agreed to speak at a daylong event hosted by the Military Reporters and Editors group that week, his staff rebuffed a last-minute request to put the session on camera. Still, the joint chiefs chairman said he insisted on keeping the meeting and took pains to underscore the media’s place in the American system.